Trevor Booker gave a thumbs up after learning that both he and Lamar Odom would be receiving double-technicals, instead of just a technical on Booker. And a bearded man with an indoor fashion scarf gazed. Hmmm… What do you think? This GIF below seems to show the play, which happened as Chris Paul was hitting a J to put the Clippers up five points with 32 seconds left. Booker and Griffin were assessed double personal fouls. MVP: John Wall … 24 points, 16 shots, 6 assists, 3 turnovers, 31 minutes, plus-2. Stat of the Game: The night after controlling the Denver Nuggets on the glass, the Wizards let the bigger, stouter Clippers impose their will. L.A. pulled down 58 rebounds to Washington’s 43, besting the Wizards 22 to 11 in offensive boards. Sure, the Clippers only out-scored the Wizards 22-18 in second-chance points (in a seven point game), but the impact was far more meaningful in how many chances were taken away from Washington. The Clippers shot 36.6 percent from the field but attempted 93 shots; the Wizards shot 41.6 percent but took just 77 shots. With the Wizards down by two with 7:23 to go in the third quarter, Nene got called for his second foul defending a slightly out-of-control post move from Blake Griffin. At 6:52, Nene got called for his third foul for an elbow to Griffin’s chin. While Kia Motors executives everywhere gasped in horror, a slow-motion replay showed that the alleged elbow never came close to connecting with Griffin. Wittman, normally resigned to expressing silent incredulity, got his second technical of the season from the trigger-happy Joey Crawford. The coup de grace of this sequence came one minute after it began, at 6:23, when Nene was called for his third foul in one minute on yet another semi-backwards Blake Griffin attempt. Although the Wizards would crawl back into it again, this series of unfortunate events killed a promising Washington comeback and neutered their best frontcourt player for most of the second half. A.J. Price did pretty much what a backup point guard does—17 minutes, seven points (2-4 FGs, 2-3 3Ps), four assists, zero turnovers, and one rebound on this night. Seems nice, except for Price is still starting as John Wall works his way into the season. And when you’re facing Chris Paul—even if CP3 was returning from a four-game absence due to a knee injury—it means that the Wizards are going to be outmatched in running a team. And they were. While Paul was only 2-for-6 from the field in the first quarter, his aggression helped fuel the Clips. Price finished a team-worst minus-10 in plus/minus and, although his numbers were OK-ish, he didn’t do enough to help quell Wizards sloppiness early. The box score says Beal played 32 minutes, but he seemed to sleepwalk through the first 25 of them. He lost Willie Green on multiple defensive possessions in the first quarter, the most egregious being a Willie Green put back while Beal stood flat-footed 10 feet away. The good news is that Beal eventually woke up when he was subbed-in for Crawford with 7:10 to play in the fourth quarter and the Wizards down four. Beal started a run when he picked CP3’s pocket beautifully while Paul was setting up a pick-and-roll with Grant Hill (Beal missed the fast break layup but Booker grabbed the rebound and scored). Beal followed that up with a corner 3 off a nice drive and kick from Wall to cut the lead to two, and then he hit another corner 3 a few minutes later to once again draw the Wizards within two. Unfortunately, Beal’s night (and the Wizards’s night) ended with a questionable 3-point attempt that was blocked by Matt Barnes after Beal was unable to create any separation from the taller defender. Overall, a quiet night from Beal (one rebound, no assists) but at least he stayed hot from downtown. Let’s say you are an NBA player in 2013. Your backup is Trevor Ariza, and your backup gets significantly more minutes than you. Our only conclusion is that it just hasn’t been a great week for you, our hypothetical NBA player, who is actually Martell Webster. A potential put-back slam by Martell that flew in the wrong direction was just one miss on a 1-for-7 shooting night. Webster contributed four rebounds (two offensive) and three assists before checking out halfway through the third quarter, ne’er to be heard from again. Nene started the game in attack mode. With Wall still coming off the bench, perhaps that’s what he felt he needed to do against the Clippers. Perhaps George Karl’s curious words about Nene the night before in Denver resonated: “We kind of wanted Nene to be more assertive and more demanding of his skills.” (via @MrMichaelLee) In seven first quarter minutes, Nene took four shots, made three, had two rebounds, one assist and two turnovers. He took it to both DeAndre Jordan and Blake Griffin, while taking the responsibility for guarding Griffin (who was 1-for-5 on FGs in 1st). But over the rest of the night, Nene played 20 minutes, went just 3-for-10 from the field (missed one FTA), and got five rebounds, one assist and one turnover.The problem: Foul Trouble. Nene didn’t get one break from the referees in Hollywood, who must not have appreciated Nene’s general Brazilian flair for the dramatic. The refs did get enthralled by Griffin, however, hitting Nene with foul for a phantom elbow that hit nothing but air. Late in the game, Nene picked up his fifth foul on the most trivial of calls and had to defensive switch off Griffin (insert Trevor Booker). 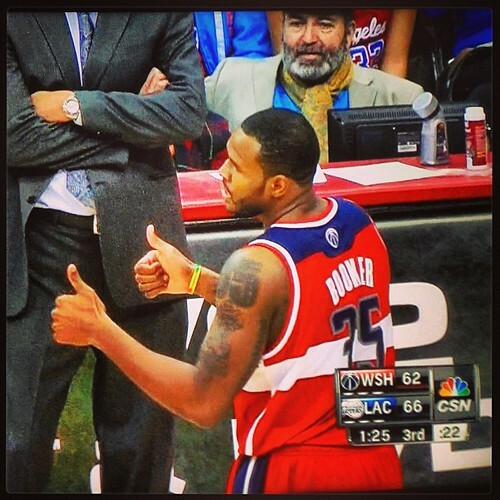 On this night, in the subconscious of the refs, Nene clearly lost the psychological battle to the hometown hero. The Clippers dominated the Wizards on the glass (58 total vs. 43 total, 21 offensive vs. 11), but it was not Okafor’s fault. Emeka was very active when he was on the floor, tying a season-high with six offensive rebounds, swatting three shots and making a concerted effort to keep DeAndre Jordan off the boards. As the game progressed, Wittman countered the Clippers’ small lineup with a front court rotation of Nene, Seraphin and Booker—leaving Okafor as the odd man out. Unfortunately, Emeka’s teammates showed little to no interest in boxing out. Barnes, Odom, and Bledsoe combined for more offensive rebounds (13) than the entire Wizards team (11). While there is plenty of blame to go around for this rebounding discrepancy, Okafor does not deserve much, if any, of it. It seems disingenuous to call Wall a bench player at this point, as he logged more minutes than anyone but Bradley Beal, clocking in at just under 31 minutes. For the better part of four quarters, Wall was dynamic, with aggressive moves to the hoop and inspired dimes out of the double-teams by L.A. At the end of the first quarter, Wall ran a too-familiar isolation play, one that historically ends in a forced fadeaway. This time, Wall went straight up and released at the top of his jumper for an easy 2 on his way to a season-high 24 points. Wall kept the Wizards in the game with his speed, drawing fouls on consecutive plays to end the first half. Late in the game, though, it was a different story. With just under one minute to go, the Game Changer got called for palming the ball. On the ensuing Clippers possession, he was on the embarrassing end of a Chris Paul crossover (and push-off), which put the game out of reach for Washington. It must be tough being Jordan Crawford. He used to have the keys to the entire offense, he could jack shots with total impunity. Now, one sprained ankle later, he is supposed to suddenly become a team player. If tonight’s game was any indication, he needs a little more time to adjust. Crawford played 16 unproductive and uninspired minutes (three points, 1-for-5 FGs, one rebound, two assists, and three turnovers). Crawford can be an effective scorer off the bench, but he needs to find other ways to help the team when his shot is not falling. Randy Wittman picked up just his second technical on the season, which, again, colors me surprised considering the coach’s personality and that it’s been 38 games up, 30 losses down. Against the Clippers, Wittman had to turn to the interior combo of Trevor Booker and Kevin Seraphin; while both big and bruising, their wits don’t mesh well when it comes to team defense. In the third quarter, those two plus John Wall, Jordan Crawford and Trevor Ariza lost four points to L.A. in plus/minus over three minutes. That unit was minus-2 in 11 minutes together on the court on Saturday night. Most of the issues with this mix-matched crew were related to turnovers and fouls—they committed six of each in those 11 minutes. Those five have succeeded on the court before, so maybe it was a matchup thing on this night. Either way, something seemed off about Wittman’s rotations. Or maybe it’s becoming more evident that even with health and developing youth, his team is still very ill-equipped on offense.